Other legends! Baggio, R. Banks, G. Baresi, F. Beckenbauer, F. Bergomi, G. Boniek, Z. Brehme, A. Breitner, P. Butragueño, E. Careca Ceulemans, J. Charlton, B. Cruyff, J. Cubillas, T. Eusebio Fillol, U. Fontaine, J. Garrincha Hagi, G. Hurst, G. Jairzinho Kempes, M. Klinsmann, J. Kocsis, S. Krankl, H. Krol, R. Lato, G. Leonidas Lineker, G. Maier, S. Maradona, D. Matthaus, L. Meazza, G. Milla, R. Monti, L. Moore, B. Muller, G. Neeskens, J. N'Kono, T. Overath, W. Passarella, D. Pele Platini, M. Puskas, F. Rensenbrink, R. Riva, L. Rivelino, R. Rossi, P. Ruggeri, O. Rummenigge, K-H. Scarone, H. Schiaffino, J. Scifo, E. Scirea, G. Seeler, U. Skoglund L. Socrates Stabile, G. Stoitchkov, H. Tomaszewski, J. Valderrama, C. Varela, O. Vogts, B. Völler, R. Walter, F. Yashin, L. Zico Zoff, D. Zubizarreta, A. One of the most complete left-backs in European soccer ever, Andreas Brehme, spent ten years in the German national team. He played in Barmbeck Uhlenhorst and FC Saarbrücken before he joined Kaiserslautern where he gained his place in the national team in 1984. Brehme was a “two-footed” player. He provided perfect crosses with his left, but preferred to shoot with his right. Neither he or the German national team had any success in the European championship held just months after Brehme’s debut. The first round knock-out was not accepted and when Beckenbauer rebuilt his team for the Mexico World Cup in 1986, Brehme was one of his safest cards. Andreas was instrumental in the latter stages of the tournament scoring a goal in the semifinal against France and his two corner kicks in the final against Argentina, lead to two goals, although the South Americans won 3-2 in the end. Brehme was tempted to try his luck in the Italian league and joined Inter Milan along with his German teammates Klinsmann and Matthäus. He won the Serie A in 1989 and a year later he won the World Cup with West Germany playing several of the matches in his home stadium, the San Siro. 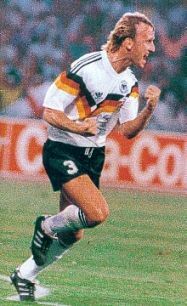 Brehme scored three goals including the matchwinning penalty in the final against Argentina five minutes from time to revenge the defeat of four years earlier. Andreas later returned home to German football to have a brief spell with Bayern Munich before joining Kaiserslautern again where he won a German Cup and another Bundesliga title at the age of 37 in 1998, the year he retired. His last World Cup was in 1994 in USA where he was one of the veterans axed after the quarterfinal defeat to Bulgaria.